What he is saying is his basic approach to how he creates an action game. The idea is rooted in that you shouldn’t pad your game with content users won’t enjoy in order to control play time to the end of the game. It isn’t something he wants to do, or thinks you should do. BTW, if you didn’t know @PG_Kamiya is the kind of director who will pack as much content into the game as he can until he is satisfied. If we were to give in to all his desires, the game we’d ship would probably be some super-long action game that no one would beat. I’ve been teamed up with @PG_Kamiya as his producer for a long time now, and game length is something I’ve never worried about. And I’m sorry I can’t explain to you in exact terms why I think you will have so much fun with TW101. I promise there will be plenty of news about the game in the days and weeks to come. But I will say this – Everyone here is working incredibly hard to make sure you say two things about TW101. One: I’m happy I bought a Wii U! 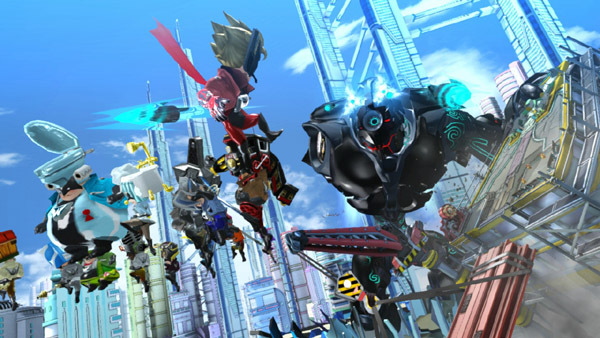 – Two: I’m happy I bought The Wonderful 101! Sorry for the flood of tweets, but thanks for staying with me! Some of Kamiya’s previous games, including Bayonetta, Viewtiful Joe, and Devil May Cry also had an emphasis on fun and replayability while still having a decent length in a single playthrough. If The Wonderful 101 is anything like his previous works, then one wouldn’t need to worry about how long the game is.